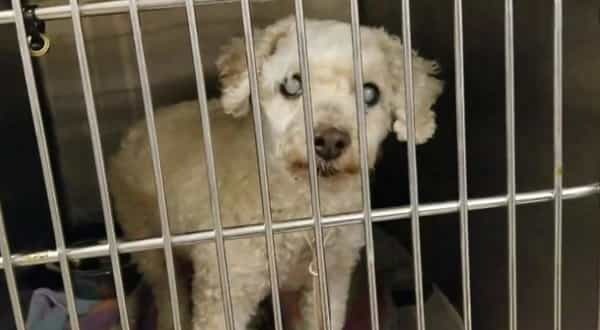 How does a 12-year-old dog who is blind and barely weighs six pounds wind up at the Harris County Animal Shelter? Volunteers begging for help saving this little dog can not imagine him sitting alone in the loud, cold and frightening shelter without someone helping him. And yes, This senior needs a miracle. Share this little dog’s plight with friends, family, social media contacts and approved rescue organizations. Sharing saves lives. This senior is eligible to be adopted by someone in the public. Doesn’t he deserve better than this? Please help. UPDATE: NOT SAFE!! To ensure safety, this animal needs an adoption hold by 5:30pm OR a rescue group to claim by 5:50pm WEDNESDAY 1/17 Only takes one person to save! ADOPT! FOSTER! 1 Response to "12-years-old blind senior begging to be saved from deadly shelter, Only takes one person to save him"
I have a blind 16 yr old chiweenie and would never do this to her!